An ideal website is the one with the perfectly optimized content, a great Search engine ranking, and a power-packed desktop and mobile performance. Most importantly, it should load within 2 seconds or less! If your website isn’t promising enough to deliver these elements, it will eventually stoop down to lower search engine rankings. Ensuring that your big or small website has all these characteristics and delivering them righteously can be quite a task. But, with tools like Google PageSpeed Insights, website owners have been empowered. The Google PageSpeed Insights metrics is based on how well an existing website is performing through its Desktop version and the mobile version, based on several grounds. The end goal of this exercise tool is to guide the website owners to take the right corrective measures in order to ensure optimal website performance by providing scores. Are you impressed with what this tool can do to help your website perform better? Do you want to achieve the perfect score? Do you want to rank well? 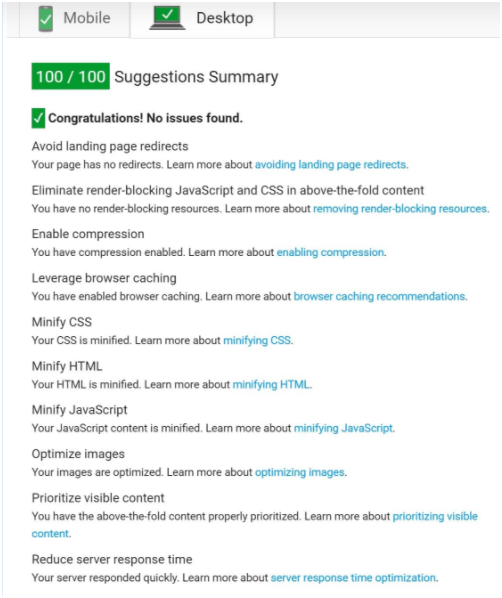 In this blog post, we will help you discover the power pointers which can help your website achieve 100/100 on the Google PageSpeed Insights test. When the tool runs the PageSpeed analysis for your website’s URL, it returns PageSpeed scores and finally produces suggestions of potential optimizations which can help your website run faster. This information will be highly useful while you are building up a website or revamping your existing website. The steps have been furnished by the tool itself and we have listed them in the similar order. This is a very basic step which requires you to remove any unnecessary redirects found on the landing page of the website which discourage the requesting visitors to navigate elsewhere from the homepage. These landing page redirects also slow down your website while no content is pulled up for the visitor to see. All-in-all, the improvement of your website’s performance is dependent on the minimal use of redirects i.e. minimal wait time for the visitors. To fix these redirects, one can use plugins like Redirection by John Godley. With over 9,00,000+ active installations, this plugin is capable of handling 301 redirects, figure out 404 errors and other similar ones. Alternatively, this guide can help you understand the theory behind redirects. If your website is stuffed with large images which are eating up your website’s bandwidth, your website will load slowly, forever. To do away with that, you need to compress images. Compressing them will take away their file size and at the same time, maintain the quality of the images. Whenever we request to visit a URL for the first time on our browsers, it loads a lot of website elements for us to view and that takes a fraction of time. However, when we repeatedly view the same website, it uses browser caching to remember the resources which had already been loaded. A caching checklist would be helpful. Therefore, you must incorporate changes in your website so that it can take advantages of the browser caching. One of the tools to help you do so is the W3 Total Cache. Through Minification, unnecessary and unused code, redundant formatting, comments, etc. are removed. This activity doesn’t affect how the browser pulls up the data afterward. In fact, it speeds up your website loading time. Resource CPU starvation, or memory starvation. These factors must be taken into account, regularly monitored and measured to make any performance checks. FYI, the ideal server response time should be under 200ms and it will largely depend upon the efficiency of your web hosting options. If you want to learn more about Accelerated Mobile Pages, visit this link. Tip: You can try using the Speed Booster Pack plugin by Macho Themes to get a better score on several online website speed testing services. We hope that these tips and power pointers will help you achieve the full score on Google PageSpeed Insights. All you need to do is take steps which accelerate your website’s speed for enhanced viewer experience. If you have more suggestions up your sleeve, kindly drop them in the comments below. Previous Post Is Gutenberg the beginning of the end of drag & drop editors?